Inventory We are a resale marketplace, not a box office or venue. Ticket prices may exceed face value. This site is not owned by Nassau Coliseum . 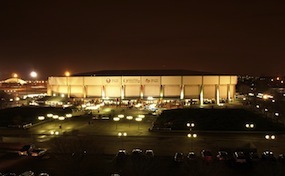 The Nassau Veterans Memorial Coliseum, commonly known as Nassau Coliseum or simply The Coliseum, is a multi-purpose indoor arena in Uniondale, New York. Home to the New York Islanders of the National Hockey League, the Coliseum is located approximately 19 miles east of New York City on Long Island. The Coliseum is also used for concerts, large exhibitions and shows of various kinds, as well as trade shows. The Coliseum originally had a capacity of 12,000 to 15,000 depending on the event, but in the early 1980s the maximum capacity was increased to around 18,000. It currently seats 16,250 for hockey, up to 17,760 for concerts and 17,686 for boxing and professional wrestling. The arena has hosted many live wrestling events, most notably the first-third of the World Wrestling Federation's WrestleMania 2 in 1986. ColiseumUniondale.com is a privately held company that specializes in the sale of tickets in the secondary market. We are not affiliated with any official supplier or box office. To purchase tickets to any Nassau Coliseum in Uniondale events simply call our operators at anytime or click on the event you wish to attend.